KNOXVILLE, Tenn. — No. 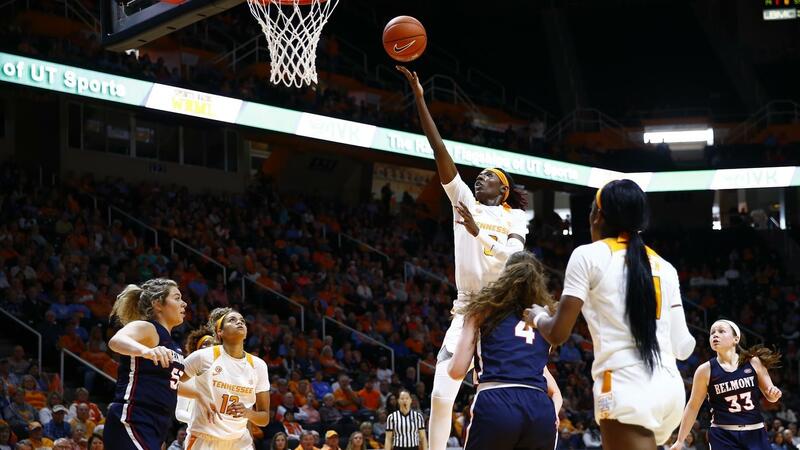 10/10 Tennessee led by as many as 18 points before holding off a late rally to secure an 84-76 victory over Belmont in front of a season-best crowd of 8,546 on Sunday afternoon at Thompson-Boling Arena. Evina Westbrook led the way for Tennessee with 20 points, seven assists and six rebounds. 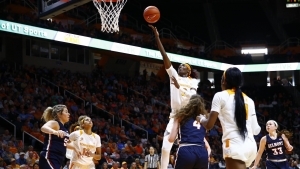 The sophomore guard had 11 points in the fourth quarter alone to resurrect the Lady Vols’ offense after they managed only eight third-quarter points. It marked the sixth time in her career that Westbrook eclipsed the 20-point mark in a game, with all six occasions coming this season. Sophomore forward Rennia Davis posted another strong performance, finishing with 19 points and six boards. Senior Meme Jackson and freshman Zaay Green both chipped in 10 points each to round out the double-digit scorers for the Lady Vols. Westbrook and freshman guard Jazmine Massengill dished out seven and five assists, respectively, as the Lady Vols ended up with 19 overall. The Bruins (7-4) were led by a double-double from Ellie Harmeyer, who had 20 points and 10 rebounds. She had 16 points in the second half to give Belmont a chance. The Lady Vols came out with the hot hand from deep in the first quarter, knocking down six 3-pointers to take a 26-20 lead. Davis was 3-of-3 from beyond the arc in the period and led all scorers with nine points. Belmont took a 10-6 lead early on, but Tennessee responded with an 11-0 run. In the second period, UT used its size advantage to build a 16-point lead going into halftime, as six of the Lady Vols’ 10 baskets in the quarter came in the paint. Tennessee sustained its success from the arc as well, knocking down nine 3-pointers before intermission, which was one short of the season high for threes in a game. UT shot a 53-percent clip (19-of-36) from the field in the first half to take a 51-35 lead into the break over the Bruins. The Bruins wouldn’t go away easily, though, outscoring the Lady Vols 23-8 in the third quarter to pull within one heading into the final period. Belmont ended the frame on a 16-2 run to make it a 59-58 game in favor of UT. Belmont grabbed the lead, 64-63, with 6:12 remaining and again at 66-65, with 5:27 to go, causing some concern from the partisan crowd. The Lady Vols, however, used 8-of-13 accuracy from the field and 9-of-12 shooting from the free throw line in the fourth quarter, while holding Belmont to 8-of-22 on field goals, to turn back the Bruins’ upset bid. Up Next: The Lady Vols will begin SEC play on the road on Thursday, facing Auburn at 7 p.m. ET (6 p.m. CT). 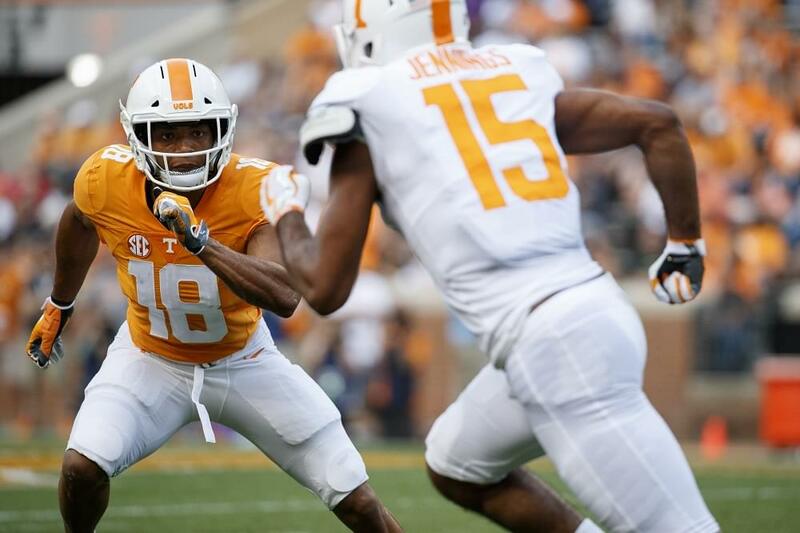 The game will be streamed on SECN+. Threes Dropping Early: Tennessee shot lights out from three in the first quarter, converting six of their eight attempts from beyond the arc. UT’s six 3-pointers were more than the Lady Vols had in three games this season. Rennia Davis was three-for-three from behind the arc in the opening 10 minutes, tying her career high in the first quarter. Jaz Finding Her Groove: Through the first nine games freshman Jazmine Massengill averaged 2.6 ppg., 3.9 rpg. and 1.2 apg while shooting .265 from the floor. Over the last three games she’s averaging 7.0 ppg., 6.0 rpg. and 4.6 apg. while shooting .588 from the field. Three-Ball Frequency: Tennessee hit nine treys against Belmont, extending its streak of games with seven or more threes in a game to five for the first time in Lady Vol history. Sharp Shooters: Tennessee hit a blazing 52.8% from the floor in the first half, its highest first-half shooting percentage since shooting 59.4% against Texas A&M at home on Feb. 1, 2018.